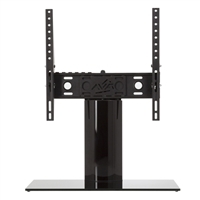 B402BB-A Table Top Mount for TVs 37"- 55"
Fits all TVs with mounting points (VESA). Patented Tools free Finger-tip tilt mechanism. 30 degrees of rotation. Built in Cable management. All TV fixings included.